Nuchal Fold Translucency Scan | 3*21: We 'suffer' from Up Syndrome. I am also disturbed by the reportedly high number of babies aborted when diagnosed with DS. I wonder if some of these decisions are made partly as a result of misguided information, lack of information, thoughtless wording at time of diagnosis, subtle prejudices, etc. The choice of words from the medical staff is hugely important. Think about the difference between being told: “I’m afraid to tell you, the foetus has a high risk of having Downs Syndrome” compared to “The test shows that the foetus has a high chance of having Downs Syndrome.” The first statement conveys a subtle negative attitude rather than stating just the facts, without any bias. 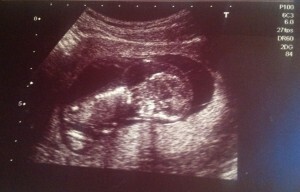 I remember quite clearly my own experience of my 12 week scan. My partner (aged 35) and I (aged 32) went down to the hospital, dressed in leathers on a motorbike, filled with excitement and anticipation of seeing our first born for the first time. I only had a slight pang of fear that he/she might not be alive and that it would all be over before our journey into parenthood had begun. Everyone else does – so it’s just a standard health care thing during pregnancy. To primarily see that the foetus is alive and then to measure it and estimate the due date of the pregnancy. Neither my partner nor I registered the fact that we would be having a specific test; we didn’t know what the ‘nuchal fold test’ was and I’m not sure we were ever told it was going to be carried out? We were then ushered to a private waiting room to speak to an obstetrician in more detail. We don’t remember so clearly what was said in that room as we were in disbelief and I guess shock. I remember the female obstetrician, who apologised for keeping us waiting. She asked if a female junior doctor could sit in, and I think the third person present was a senior nurse. I don’t remember getting any answers to my previous query about what else might cause such a high nuchal fold reading (for answers see below). I think the obstetrician said that the combination of the femur measurement and the nuchal fold measurement meant the diagnosis was likely to be accurate. She mentioned CVS (Chorionic Villi Sampling) and amniocentesis (from 15 weeks) could be offered to find out for certain if the foetus had a Trisomy of some type. What both of us can remember clearly is that there was an over-riding expectation that we would have an abortion and that if we had wanted to, we could have checked into the hospital right there and then to have it done! Even though it certainly wasn’t the first option in my mind, I felt compelled to ask a lot of questions to find out exactly how an abortion takes place – being a biologist myself, I needed to know all the details before I could consider it as a course of action. I naively thought that it would simply involve taking a pill and it would all be over. I was horrified to learn the facts. She gave me details of the ‘procedures’ for abortions of foetuses less than 14 weeks. I will not repeat the details here but there is plenty of information elsewhere on the Net if you want to know more. I was shocked by what she told me: Firstly, that there would be no painkiller/euthanasia for that little being that I had just seen bouncing around, despite it having a well developed nervous system. Secondly, that it clearly had no rights and was thought of as a ‘foetus’ not a baby, and thirdly, I couldn’t imagine how the doctor performing it could go through with it or indeed how I would live with myself. She went on to explain that, once the foetus was over 14 weeks, then it would be unlikely that any doctor would want to perform an abortion in this way, on account of the foetus being larger and it being too difficult/ distressing. In this case, the abortion would be by means of taking a pill to bring on labour. This option also sounded awful to me. I remember being very concerned that the baby could possibly be born alive, even if just for a short time, and her saying that it was highly unlikely due to the stresses of labour. She mentioned some possibility of an injection into the foetus’s heart but I don’t remember the rest of the details….I didn’t want to hear anymore. All the while that I was getting to grips with the grim reality of what abortion really meant, I remember the junior doctor looking at me sympathetically with tears rolling silently down her cheeks. I remember thinking why are YOU crying; surely it should be ME who is crying?! Although I shed a few tears when trying to voice my more difficult questions, mostly I just felt numb and shocked and that abortion was definitely not for me and why did it seem to be offered so casually and matter-of-factly? In my mind, having marvelled at the jumping being inside me, I just couldn’t contemplate making the decision to end that life. That was the thought that scared me the most. I was clear in my mind that we needed more information before we could possibly make any decision. Therefore, we were booked in for CVS the very next day. The risks of possible miscarriage that she spoke of (2% for CVS and 1% for amniocentesis) seemed negligible in the face of being ‘non compatible with life’ or being aborted. I had also made the decision that I could only consider abortion to be an option if I was told with absolute certainty that the baby could not survive independently of hospital machines. Q1. What was a nuchal fold/ nuchal translucency scan actually measuring? Answer: The width of the fluid filled space under the baby’s skin, at the back of the neck. See scan photo above – you can make out a faint line like a hood or bubble over the baby’s head. On finding this out, I was even more concerned, as surely this meant that our baby had a hugely deformed head in comparison to its body? The medical term for this fluid retention is oedema (UK) or edema (US). Q2. Could a large nuchal fold reading be caused by anything else or a combination of things? Answer: Yes, lots of things – a list as long as your arm, that weren’t even mentioned to us. The reason they are not mentioned is that the most common causes are the Trisomies but there are many other conditions that could be the cause/ or adding to the oedema (fluid swelling). Examples – heart defects, Exomphalos, Parvovirus, Turners Syndrome, polycystic kidneys, bowel obstruction, Spina Bifida, etc, etc. Q3. Had anyone had such a large nuchal fold measurement as ours? In my mind, the larger the reading, the worse the prognosis must be? How was the foetus even able to survive with so much fluid in its head? The largest readings I could find on the internet were 6mm and our reading was more than double that! We went for the CVS the next day at St Georges Hospital, Tooting. The expectation that we would have an abortion continued: The doctor performing the CVS, although nice enough, said, and I quote: ‘I think we will all be able to live with ourselves better, if we know for certain.’ By this I assume he meant, we could live with ourselves for having terminated a baby that we were sure had a Trisomy, although he was not specific as to which one. Again, I remember feeling somewhat confused that this place of medical expertise, where people go to be made better, seemed so ready and willing to end a life. He was however able to give me some clarification/ hope. I asked him had he ever seen a nuchal fold reading as large as ours, as it seemed dauntingly huge. He said he had and that there was even a possibility that the child could be ‘normal’. There was also a chance it could be a diagnosis of Turner’s Syndrome, which didn’t sound a bad option! I saw on the paperwork that we were given afterwards, he had written ‘parents have been informed there is 70% chance of an adverse outcome.’ I’m not sure what he exactly meant by this. A few days later, the telephone call came. In my heart of hearts I somehow already knew, even before the nurse on the phone said “Are you sitting down….? The CVS test confirms that the baby has Downs Syndrome.” I wasn’t sad, I wasn’t surprised, I was relieved that it wasn’t one of the other Trisomies, deemed ‘non-compatible with life’* (see below). Now all we had to worry about was whether the baby had any other health issues and whether the excess fluid in its body would resolve itself. I was scared that my baby might not make it but I felt very, very relieved that I no longer had to make that decision. It was down to Mother Nature now. Thankfully, over the next few weeks the fluid did reduce and by week ~24 it had disappeared altogether. We were also having regular heart scans which initially showed a ‘leaky heart valve’ that was allowing some blood back the wrong way but this also resolved itself by ~35 weeks gestation. My daughter was born alive and well at 38 weeks + 2days, a healthy 6lbs 7oz. She initially had a small hole in the heart, known as a Patent Foramen Ovale (as do ~10 – 20% of the general population) but this had closed naturally by her 1st birthday. Other than coughs and colds in the winter and some minor skin issues, she is thankfully in good health. This entry was posted in Health/Development, On Your Soapbox by Stella. Bookmark the permalink.